Marks Dimensions 12 1/2 in. x 9 1/2 in. x 3 1/2 in. Possibly the only decent soaker in the 2004 Hasbro line, the Liquidator has a reservoir capacity of 500ml and works by pressurized reservoir power. It has a nozzle estimated at 1.8X working off Max-D trigger technology with a maximum range of just under twelve metres. It takes around fifteen pumps to reach top pressure when the reservoir is four-fifths full, the recommended fill level, but pumping is quick and quite smooth. Even when full, the soaker is very light, very easy to hold at arm's length for longer range. The fill cap is a Fast-Filler, but therefore requires a hose to function properly, however the cap can also be removed to function normally. Although it uses Max-D trigger tech, the trigger feels quite strong and can be pulled quickly. I'd recommend adding a strap to it so you can have two, as the water is depleted fairly quickly. Overall, a good soaker for light skirmishes, in particular one hit kill battles because of its range, but really unable to stand against any CPS soaker. 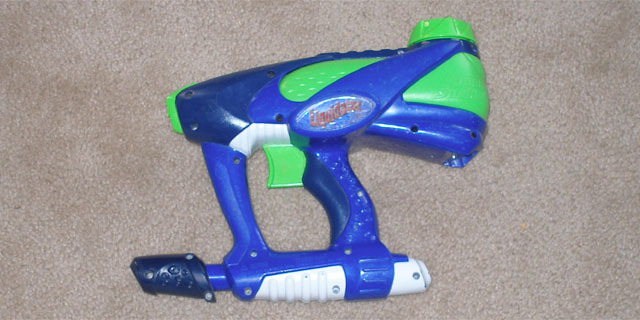 The Liquidator is advertised as the "on-the-run blaster" and it fulfills its role well. It is light and easy to carry; it also feels quite solid. As a pressurized-reservoir gun it performs well, but I would not use it as a main weapon. The gun does output much and also can't supply a lot of water. But it works well for its size and as a backup. If you own two, they may work dual-welded.